Although Tanzania is food self-sufficient at the national level, localized food deficits occur at regional, district and household levels because of dependence on rain-fed agriculture and limited use of modern farming techniques. Approximately 80 percent of the population relies on subsistence farming, and 28 percent of the population lives below the poverty line. Tanzania is classified as a least-developed country, ranking among the lowest on the Human Development Index. According to the 2015 National Nutrition Survey, almost 35 percent of children under age five are stunted. Over the last three years, Tanzania’s economy has grown at a rate of 7 percent annually, driven mainly by telecommunications, financial services, transport and construction. The discovery of large reserves of natural gas and crude oil offers promise of a new and significant revenue stream for the Tanzanian economy. Market access – WFP helps farmers transition from subsistence farming to market-oriented agriculture. WFP does this by connecting the demand for crops with commercial markets and providing access to fair contracts before planting. Food for assets (FFA) – In rural communities, WFP’s FFA programming aims to develop community assets to stimulate economic growth at the household level. By investing in the construction and repair of irrigation schemes, dams and feeder roads, WFP helps strengthen farmers’ resilience to climate change, improve productive potential of the farmland, link farmers to markets and increase household incomes. FFA is currently being implemented in the Dodoma, Tabora and Mwanza regions. Furthermore, under its climate change initiative, WFP works with the local governments of the Dodoma, Arusha and Manyara regions to provide access to information on climate and weather to enable farmers and livestock keepers to determine the best agronomic options to pursue in order to mitigate the effects of climate change. Nutrition – On the nutrition front, WFP is the only agency in the country providing supplementary food rations to pregnant and breastfeeding mothers, and children under age five. To treat moderate acute malnutrition, WFP provides monthly take-home rations of supplementary fortified blended food to these vulnerable groups. To prevent stunting, pregnant and breastfeeding mothers and children under age two also receive a monthly take-home ration of fortified blended food. WFP’s nutrition interventions are focused in the Dodoma and Singida regions, which have high rates of stunting and wasting. School meals – In 2015, WFP launched a homegrown school meals pilot in the Ikungi and Bunda districts of the Dodoma and Singida regions to enable the local governments and schools to manage a school meals program and procure food locally from smallholder farmers. Homegrown school meals create greater community ownership of existing school meals by increasing the number of livelihoods they support. Refugee support – Since the 1970s, Tanzania has hosted refugees fleeing to northwest Tanzania from neighboring countries. The Nyarugusu, Nduta and Mtendeli refugee camps in the Kigoma region currently host more than 200,000 Congolese and Burundian refugees. Through its Protracted Relief and Recovery Operation], WFP provides a food basket of fortified blended food, beans, vegetable oil and salt to meet a minimum dietary requirement of 2,100 kcal per person per day. 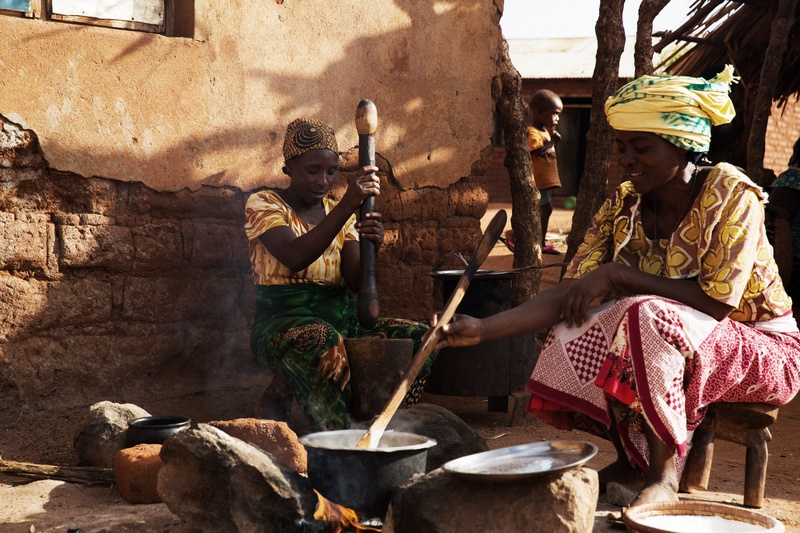 WFP assistance to refugees is their main source of food.